Hello, friends! 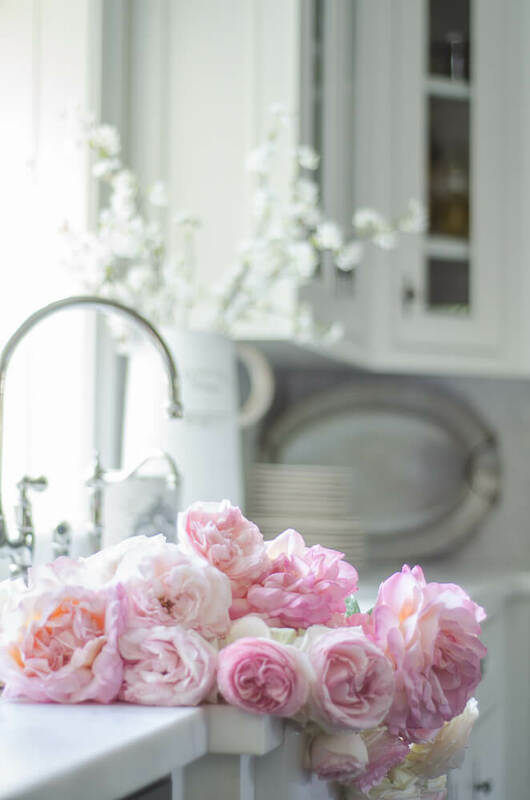 If you're looking for rustic elegant farmhouse inspiration or just love to see beautiful homes then I've got a real treat for you today. My friend Karen at Sanctuary Home Decor is giving us a virtual guided tour of her stunning home and it's the stuff that dreams are made of! 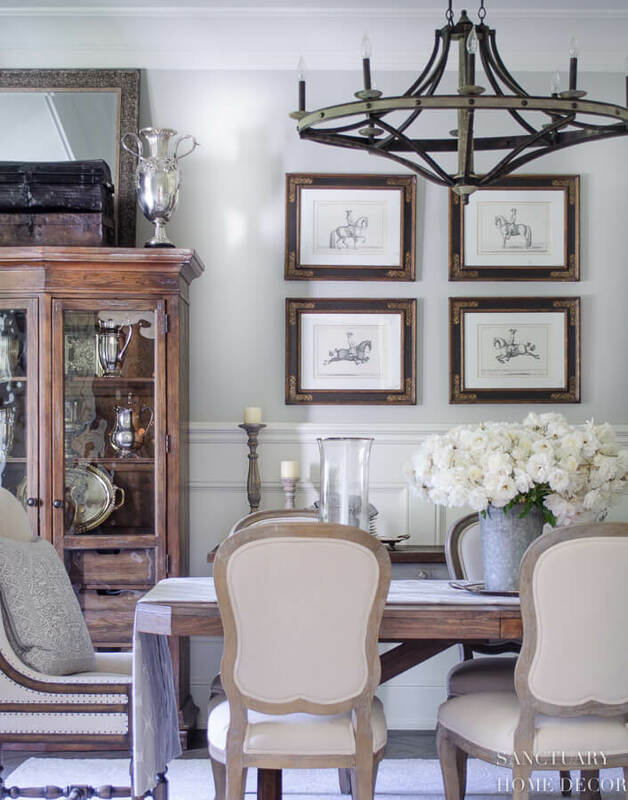 It's light and airy and is full of tasteful, timeless decor and design features. So grab your cup of coffee or glass of wine and settle in for a feast for the eyes! Karen describes each room with a description below the images. Please visit her site and pin any images from there. Our rustic elegant farmhouse in Southern California represents our love of country living mixed with just a touch of elegance to better suit "city life". We chose a palette of soft whites with accents of gray and blue throughout. The kitchen is truly the heart of our home and was designed to be beautiful yet truly functional. 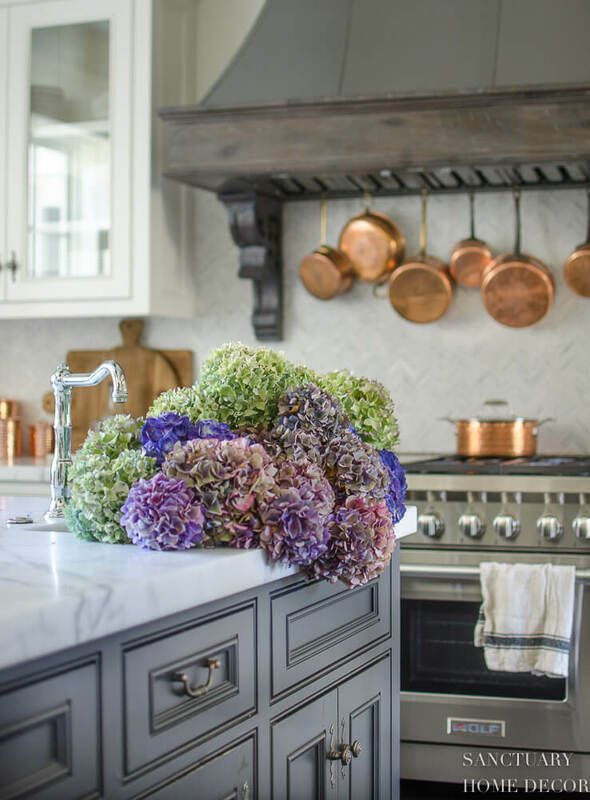 The range hood is the centerpiece feature in our kitchen and creates a warm and inviting look, while the double islands add the functionality we wanted to achieve. 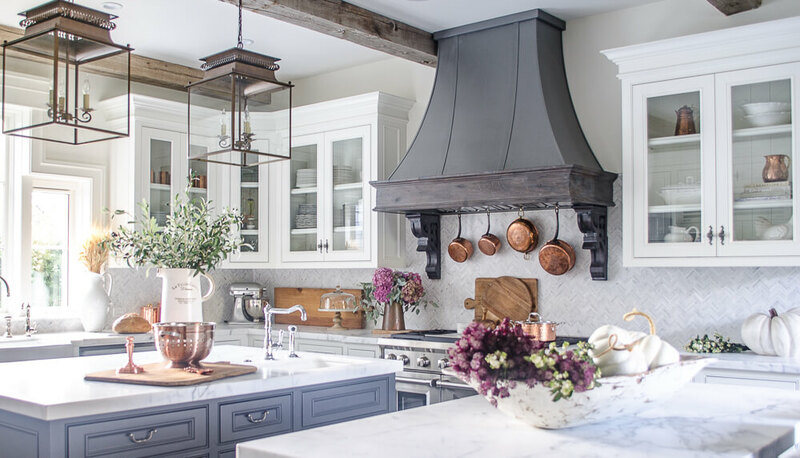 We chose bronze-toned double pendant lanterns over the prep island, which we painted a dark charcoal/blue. 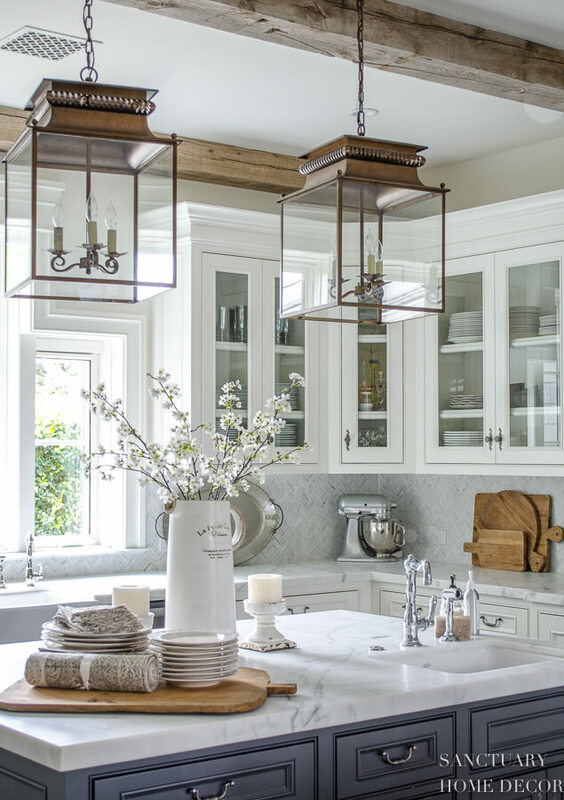 The darker center island alongside the all white kitchen provides a pretty contrast. The oversized (36”) farmhouse sink makes a beautiful design statement and is also incredibly practical and functional. Our breakfast nook is on the other side of the kitchen and because of the odd shape of that corner, we decided to be creative and included some bookshelves and a bench seat. It turned out to be very cozy as well as practical. Our living room is a blend of rustic elements with an elegant farmhouse feel. 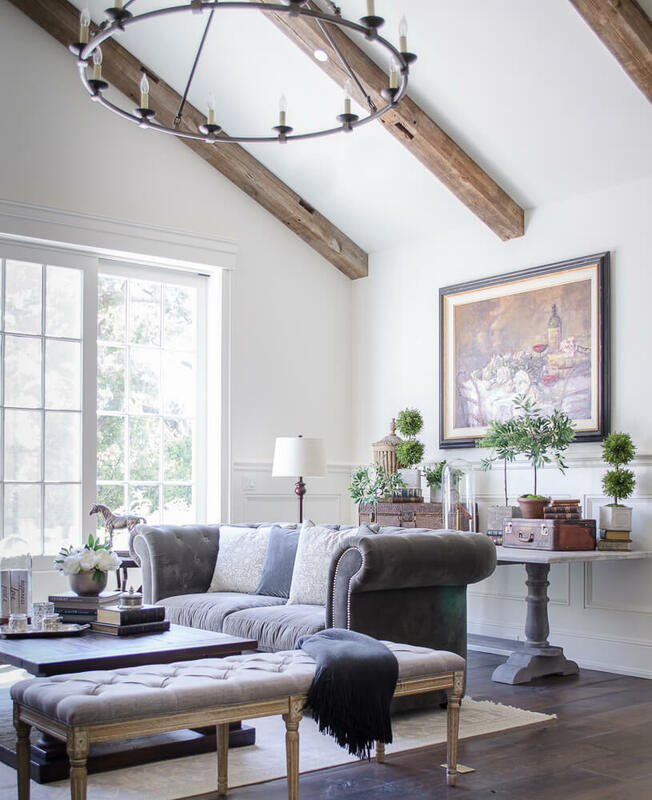 We used wide plank, French oak flooring and rustic hand-hewn beams to incorporate a farmhouse style while the furniture and decor add a comfortable, yet elegant look. The vaulted ceilings in this room allowed us to create an oversized gallery wall of framed sheet music near the piano. While I love the clean look of an all white house, I also adore color. 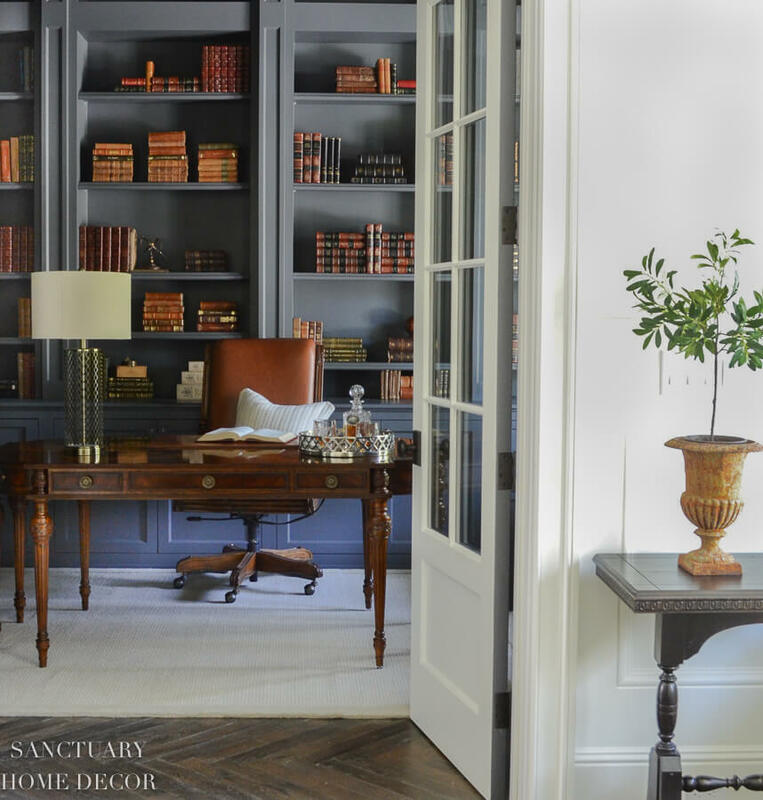 We painted the library a deep charcoal/blue tone which is a pretty contrast next to the double French doors. Our dining room is a blend of elegant details with wide crown moldings and French oak herringbone floors, yet the furniture is comfortable with an easy farmhouse style. In the master bathroom we designed double vanities with a dark charcoal finish and white marble countertops. 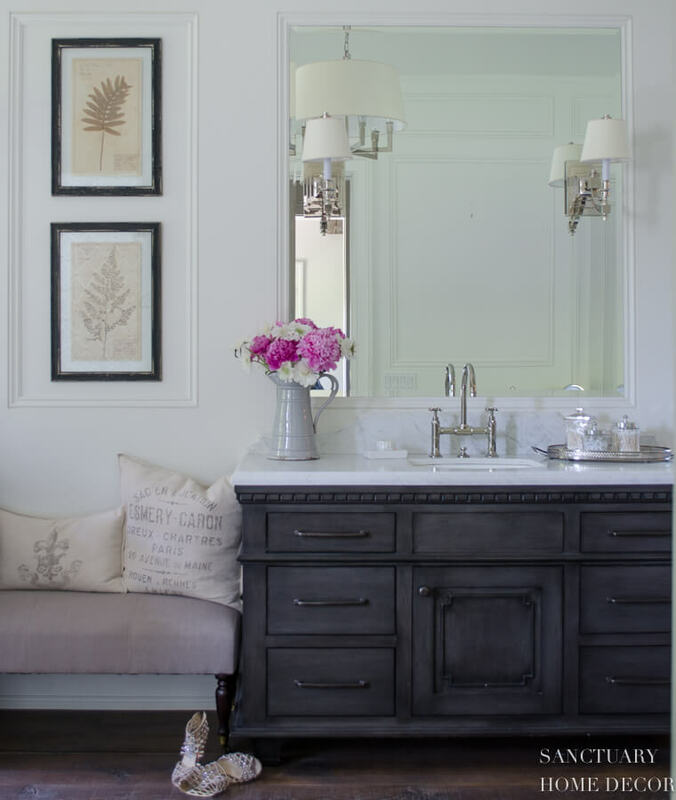 Inset beveled mirrors with double sconces keep the look very clean and fresh. 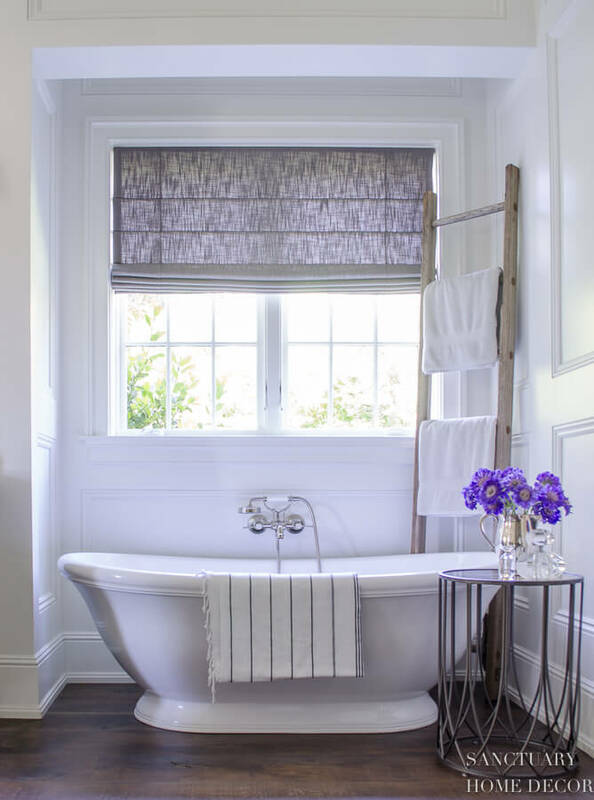 The free-standing bathtub in our master bathroom sits in a little window alcove and is one of my favorite places in the whole house! We have a small horse barn in our back yard with two horses that we love. We are able to trail ride just out our back gate, which is a true luxury in Los Angeles. 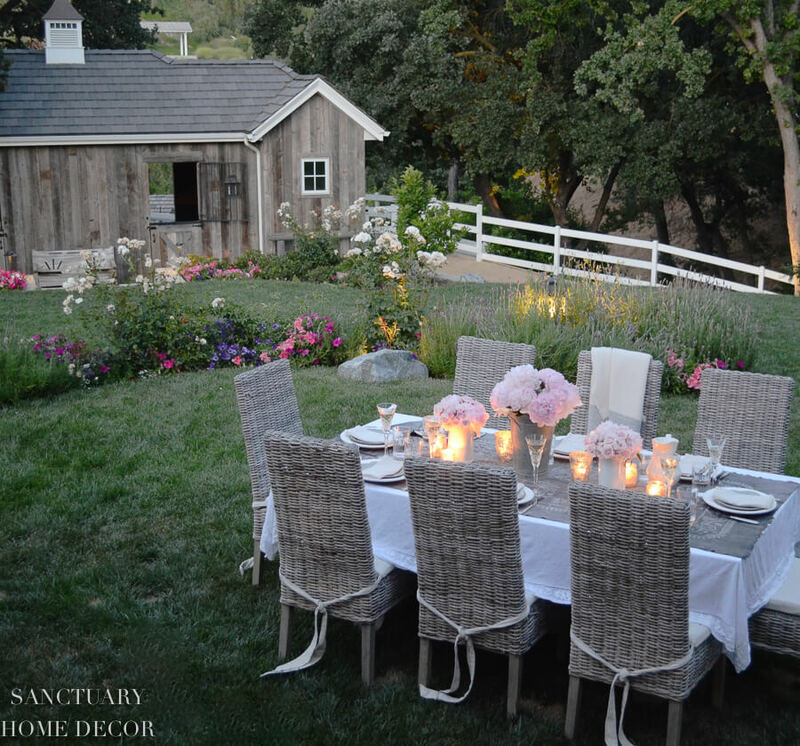 One of my passions is creating beautiful table settings and we often have alfresco dinner parties in the yard overlooking the barn. Wow, thanks so much for the beautiful tour, Karen. Your home is simply stunning. I'm sure I'm not the only one who's in love with your style. What do you think, friends? What's your favorite room in her home? 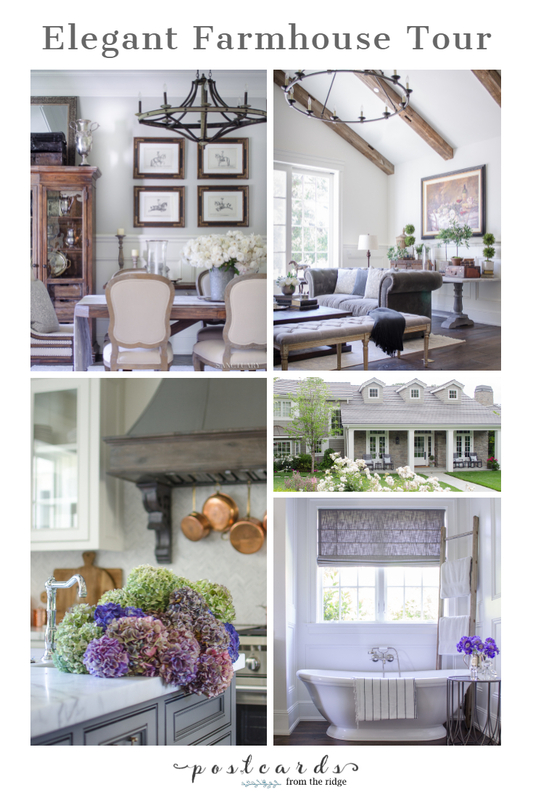 Be sure to drop by her blog and see more of her beautiful home HERE. And see more beautiful home tours HERE. I love every detail she shared! So elegantly but simply appointed from artwork to furnishings and everything in between. I would have to say her kitchen is my favorite room, although the living room is a very close second! Looks so elegant and welcomimg at the same time. Loved the whole house!